Laboratory tested and certified at over 577,000. Scoville units, the Red Savina packs a punch twice as hot as the habanero and 65 times as hot as the jalapeno pepper. It is the hottest of all habanero varieties and the King of all chiles. 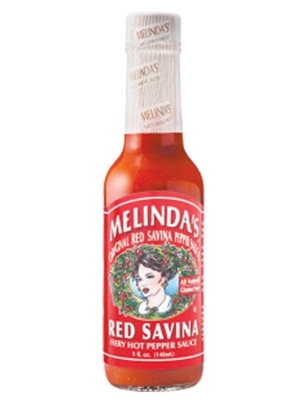 Melinda's blends the fiery Red Savina with the same fine ingredients present in our famous Original Habanero recipe to make a sauce that is extremely hot and flavorful. Red Savina Peppers, Fresh Carrots, Onions, Lime Juice, Vinegar, Garlic and Salt.